You want to blog, you’ve been told you should blog, I’ve convinced you it’s the thing to do but how do you find time to blog? This isn’t the first time I’ve covered this topic but the problem isn’t going away. I’ve shared my tips for keeping distractions at bay and staying motivated. But small business owners have so much on their schedules that even when motivated, squeezing blogging in seems impossible. I’m here to tell you that it’s not impossible, you can do it. 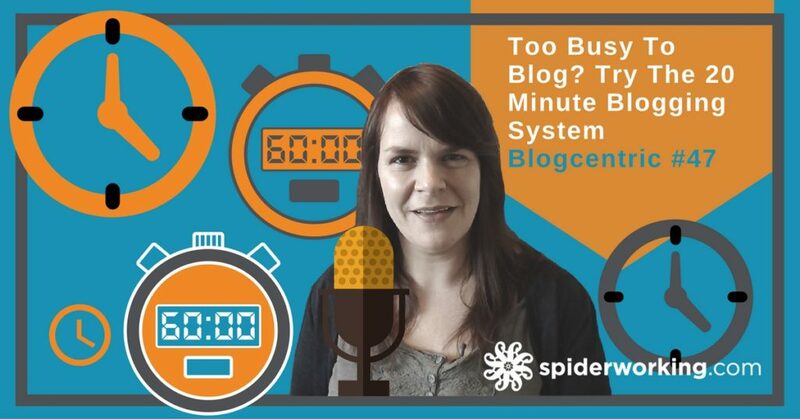 I’m going to share a system that you can use to make sure you start blogging consistently. In episode 45 we looked at goal setting. I talked about breaking your blogging goals down into smaller tasks. Today I thought we’d look at applying that method to the specific task or writing blog posts. So grab a pencil and paper and we’ll begin. There are two problems with blogging. I’ve seen it happen so often. A new blogger bursts onto the scene. They love what they are doing so they write a lot. That sudden burst of enthusiasm can last up to two weeks but then it tails off. The second problem is more common. We worry that blogging too much will eat time and this fear often stops us blogging at all. There really isn’t an easy answer to how often to post but consistency is important. Consistency means you will be building a pool of content. Remember each post is a new page on your website that can be optimised and has a chance of ranking on search engines. The more quality posts you write the more opportunities you have. Consistency is also important for you. If you get into the habit of writing and blogging you’ll become better at it, you’ll start thinking like a business blogger and start enjoying the process of creating and promoting your blog. You’ll also start building relationships with your readers. They’ll start getting used to seeing your content and expect it. Repeat visitors are gold, they are people invested in your blog and your business. Posting frequently and consistently will help build these repeat visitors. If you do have that new blogger burst of inspiration grab it but don’t publish it all at once. Store those posts up so you can schedule them once a week or once a month. If you worry about the time it will take to blog don’t let that hold you back. 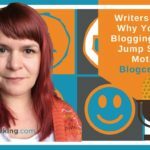 When I decided to write a book on blogging I failed to plan my time. That meant that it went on the long finger, it didn’t even make it on to my todo list. It was only when I prioritised it as a task in my daily schedule that it started to happen. So that’s what I’m going to ask you to do. I want you to commit now to writing at least one post every month. I’d be even happier if you agreed to one every two weeks or weekly but set a timescale that you are happy with. Now I want you to think about what needs to go into your blog writing. If you are writing one a month I’m going to ask that you plan a 1000 word post. You can write shorter posts if you are more frequent but aim for at least 500 words for these. I want you to spend no more than 20 minutes now breaking that down into tasks. Depending on your topic you might need to do some research, create specific images etc. Make a list of exactly what you need to do to complete the post. Once you’ve come up with your key points for task 5 you’ll need to break that down into 20 minute slots too. Next, I want you to add time right at the beginning of the day for writing the post. Day 1 you can write the headline, Day 2 Find the key image and so on. Does the task of writing seem easier now? I’m not finished. There’s at least one more 20 minute time slot you need to add to your schedule. A planning 20 minutes. Find time for this once a week. Brainstorm your ideas and map them into a schedule. Now you’ll find yourself thinking ahead, you’ll start storing up ideas to use in your next post. Now you have a plan in your head but that’s not good enough. You have to write it down or it won’t happen. How do you plan your week at the moment? Do you have a todo list? Do you plan more than a day ahead? 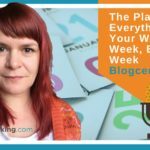 Planning at least a week at a time is going to be great for your business as a whole and for your blogging. And when I say planning don’t make the mistake I did for years. don’t pile a bunch of things onto the list for the week. Plan them and allocate time slots. This way you will have a realistic schedule and it will stop you from overworking and burning out. At the end of each day, review your plan for the next day. That 20 minutes of blogging time needs to sit right at the top of the day, a priority, a task you may not look forward to at first (although blogging does become enjoyable) but will make you feel great once it’s done. Make a pledge to yourself and your business to prioritise blogging in your schedule. 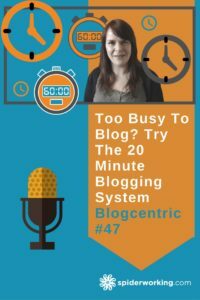 Do 20 minutes creating a plan for your blogging activity for the week right now. If you find this method successful I’d love to hear from you so leave me a comment or Tweet me @spiderworking. Before you go I’ve a proposition for you. 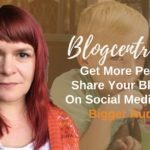 The one-year anniversary of Blogcentric is speeding towards us and I’d love to feature some of you. 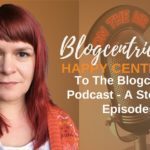 If you have made changes to your blog as a result of listening I want to hear your stories and record a short slot for the anniversary edition. So get in touch, email me amanda@spiderworking.com with your stories and we’ll set something up.